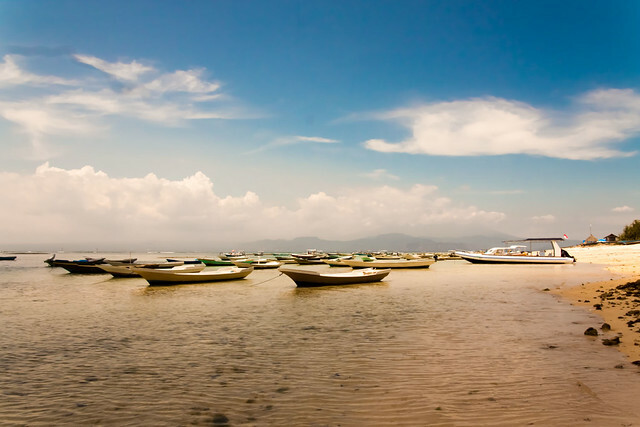 After the chaos of Sanur, the relative calm of our next destination came as a welcome. 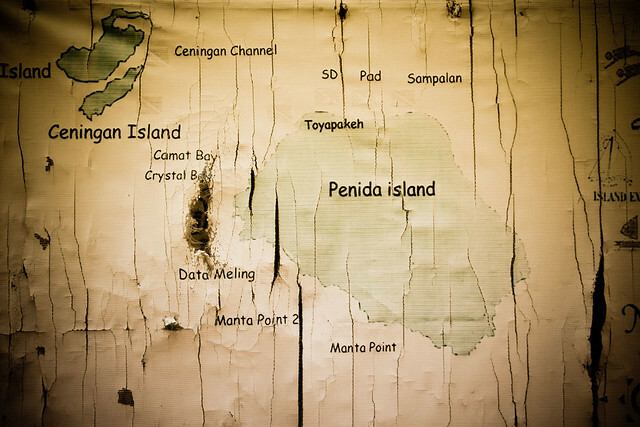 Part of the reason we chose Bali is because we enjoy diving, so our next stop was a dive center on the quieter end of Nusa Lembongan, just off the main island of Bali. 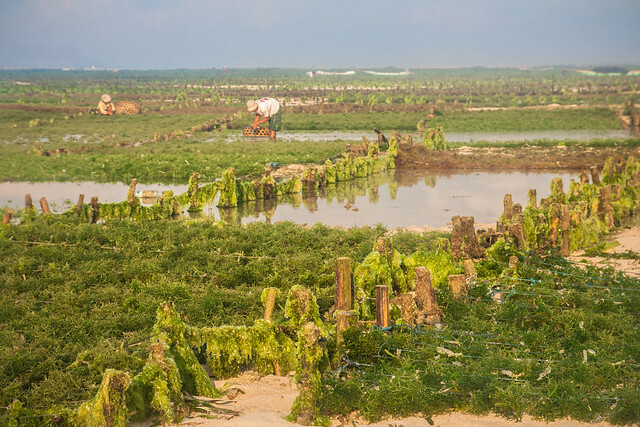 Lembongan and Ceningan are known for their seaweed farming, which competes with tourism as its main industry. The seaweed is grown on rope strung along wooden stakes in the shallow seabed, which makes the beaches a unique experience; swimming in the immediate shallows isn’t so much an option, but brave to swim few hundred feet out and you will find paradise in the form of crystal waters and living coral the size of cars just a few feet beneath you. Pondok Baruna Warung, a close walk away from Blue Corner Dive, where we stayed, offers a variety of vegan dishes, or at least dishes which can be easily veganized, but be very specific about what you will and won’t eat (for instance the nachos come served, unusually, with yoghurt, so don’t make any assumptions). Of the few iterations of Kering Tempe Manis I consumed while in Indonesia, this was one of the spicier (not complaining). I reaallllyyy recommend trying it if you aren’t a great tempeh fan, because it tastes a billion percent not like tempeh at all. Pepe’s tofu (and no, I don’t know who Pepe is) consisted of a creamy tofu coconut curry with Balinese spices, wrapped in a banana leaf and steamed. Sauteed carrots and green beans with onion come with, as does rice. If you like galangal and garlic, this is a safe order, and if you don’t then you are crazy and we can’t be friends. Also, they have a cat. 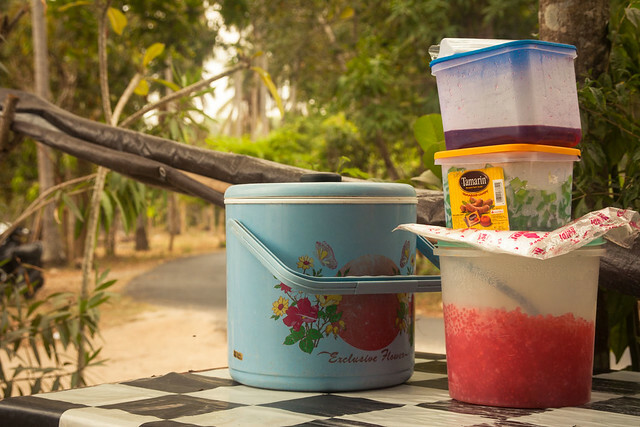 In the other direction from Blue Corner Dive is a little warung called Maria’s Boembong. 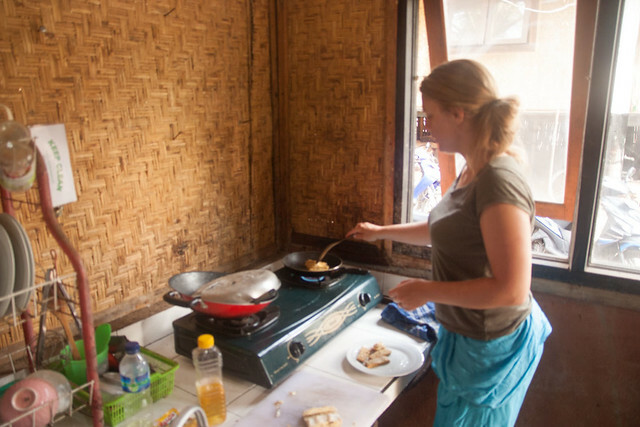 We dined on a massive plate of tempe in tangy-sweet kecap manis off of a disused (good thing) old fridge/freezer door. If you’re starving, this is absolutely the place to go as the portions are very generous. 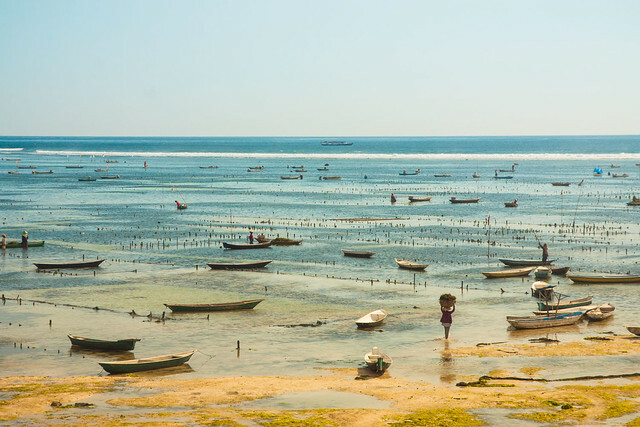 From the already serene Nusa Lembongan we jumped onto the practically untouristed (sadly I doubt it will remain this way) Nusa Penida for a three day break with the FNPF (Friends of the National Parks Foundation) Bali Starling Sanctuary. 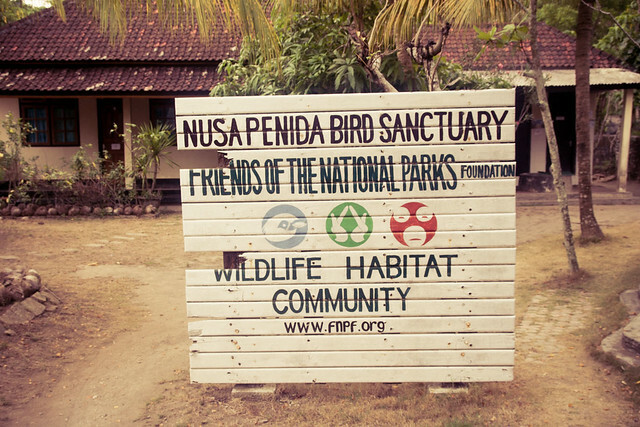 The FNPF sanctuary doubles as what it says it is, a rehabilitation centre for the endangered Bali Starling, and also as a community development and outreach project. Its volunteers not only teach locals (for free) about organic, sustainable farming and wildlife conservation, but also offer English lessons and provide space for other community efforts (we spent one lazy afternoon watching a children’s dance class by the greenhouses). There are several warungs just a few minutes’ walk down the road from FNPF, but I was aching to use the kitchen to cook some of the local finds, so on most days I ate a simple dish of deep fried tempe sprinkled with salt. 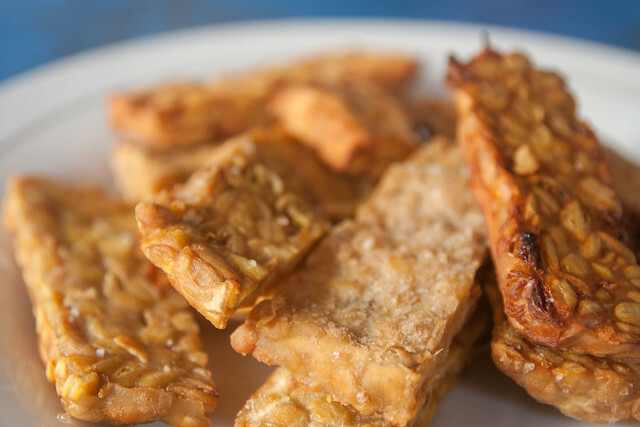 I cannot accurately describe fresh tempe, no matter how much I try, but my best attempt is to say its texture is creamy, its flavour nutty and not at all bitter. Fresh tempe does not and cannot compete with anything we buy from the stores at home, so for me (and even for my partner, who usually dislikes tempe), this was a meal we could quite happily eat multiple times a day. Did I mention each block costs approximately 20p? Across the street from FNPF is a fabulous little warung run by a woman who absolutely understands veganism. In fact we probably would have eaten here more often had she not been partially closed for refurbishment. FNPF, unsurprisingly, receives a lot of vegetarian and vegan volunteers, so the proprietor knows what’s going on when it comes to cooking without animal ingredients. 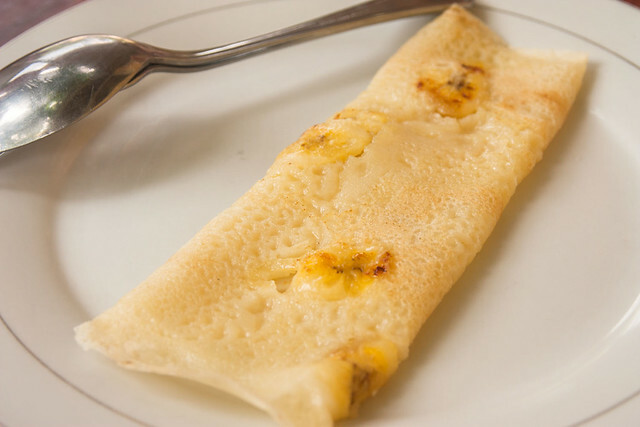 Try the egg free banana pancake! Incidentally, I would recommend against the hotel restaurant next door; I ordered a pasta dish which came with mince, and when I complained I was assured multiple times it wasn’t meat. 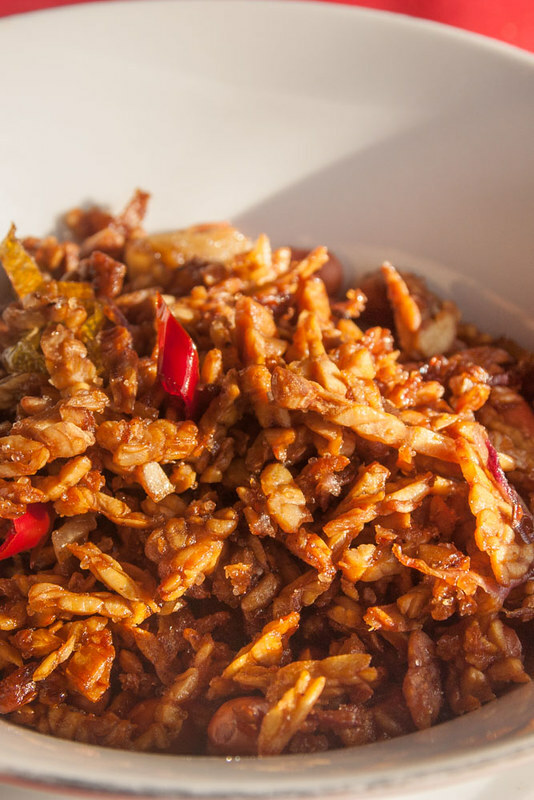 Likewise, the vegetarian nasi goreng comes with meat skewers. It comes as no surprise how much of my holiday planning is based around food, but what people don’t always understand is the adventure of finding vegan suitable food is part of my fun. 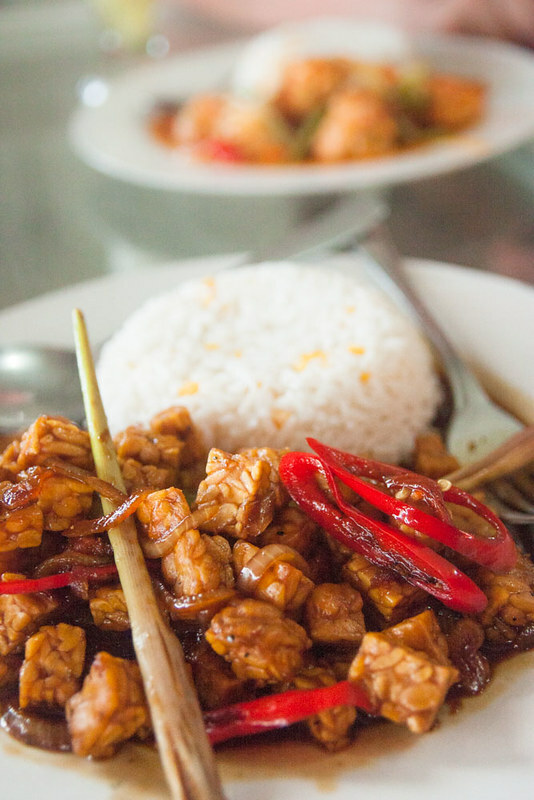 I can’t begin to recount the number of times people have questioned me (or in the past, me to myself) about what I could eat in any given destination (it has never been a problem). But be assured there is nothing to worry about in and around Bali, because even in the smallest of places you will, with patience, be able to find something. Finding the vegan food is totally part of the fun of travelling for me too. I swear I end up in more off the beaten track places because of veganism that I would otherwise. Nusa Cenigan looks AMAZING, one day I’ll conquer my fear of being underwater and go there! Hi, I love your blog. 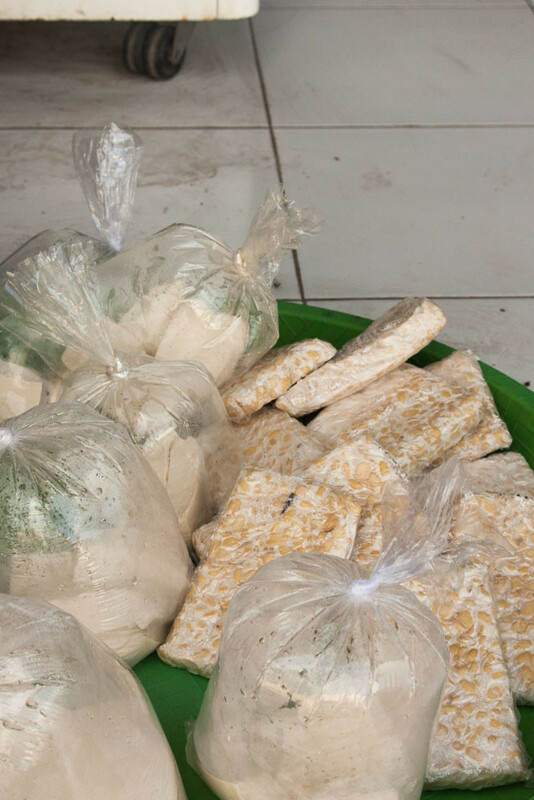 That pepes tofu looks good! I’m Indonesian, pepes is a way of cooking something wrapped in banana leaves, not a name of a person. 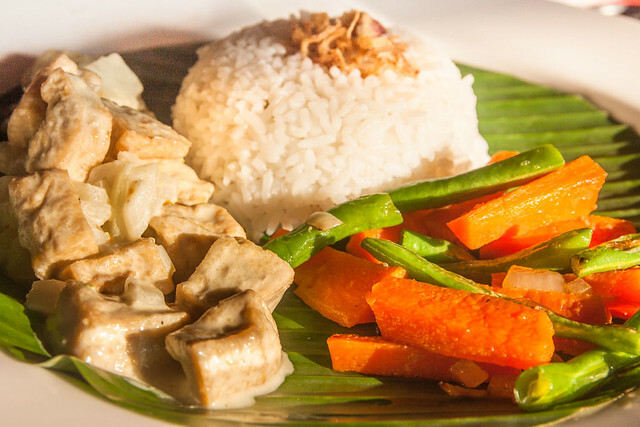 The pepes in your picture a little bit different with our homecooked pepes tofu. We usually cook it this way, medium soft tofu (mashed), mix with garlic+shallot+red chilli (grinded), sliced green onion, lemon basil leaf, indonesian bay leaf, diced tomato, egg (you may skip this if you’re vegan), salt, sugar, pepper. Mix altogether and wrapped in banana leaf, you may steam it or grill it, both ways are good.